So, hey, here’s something that should make at least some of you happy: I’m putting out a story collection through Subterranean Press called Miniatures: The Very Short Fiction of John Scalzi. Just as the title suggests, the eighteen pieces that are included in Miniatures are very short — the longest is a smidge under 2,300 words — and most of them are (surprise!) humorous. If you’ve seen me on book tour, you’ve probably heard me read from some of these pieces. I’m very excited to share them with you all in print. 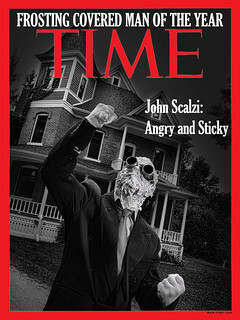 In addition to fourteen previously-published stories (including the Sidewise Award-nominated “Alternate History Search Results”), the collection includes four never-previously-appearing-in-print stories: “Your Smart Appliances Talk About You Behind Your Back,” “Important Holidays on Gronghu” and “The AI Are Absolutely Positively Without a Doubt Not Here to End Humanity, Honest,” all of which were written exclusively for this collection, and “Morning Announcements at the Lucas Interspecies School for Troubled Youth,” which I performed at W00tstock a few years ago but never put into print. Fixed that! Also, several of the stories were previously published in rare and/or hard-to-find editions. This collection makes them much easier to find, read and enjoy. 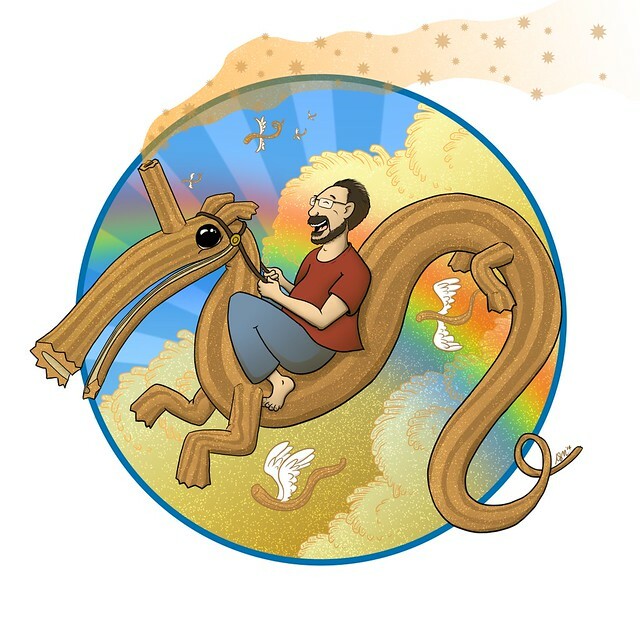 I’m also super excited to say that Natalie Metzger, who created that fabulous image of me riding a churro-corn that you see above, is providing art for the book — both the cover and illustrations for each of the stories. I asked for her specifically because I think her sense of whimsy and humor match the pieces in Miniatures perfectly, and happily Subterranean Press agreed. Natalie and I met during Westercon this last weekend to chat about her illustrations and I couldn’t be more pleased by the ideas she has for the book. You’re going to love them. Subterranean is releasing Miniatures in a signed, limited print edition of 1,500, which means every copy will be signed by me — no need to hunt me down for an autograph. Those will be $40 each. Or you can get a lettered and leatherbound edition for $250 (there will only be 52 of those). So yes, the print editions will be collector’s items. Pre-ordering would be advisable. Subterranean will also be releasing an electronic edition (pricing to be determined later, but cheaper). And yes, before you ask, there is very likely to be an audio edition, and I will get you more details on that when it comes available. Heck, there’s going to be at least one foreign language edition, too, so it’s got that going for it as well. Miniatures is going to be a ton of fun in a small package, and I can’t wait for you to see it. Ordered! One for me and one for a gift. I can’t believe they’re not sold out yet. Very excited about this. I love your writing and I am looking forward to an audible edition, I am so old I fall asleep reading (LOL) and I can listen to audio at work, so here is a cheer to your audios books! Based on the first two words of the title, I was hoping that you were producing actual miniatures (maybe in conjunction with Games Workshop). Who wouldn’t want miniatures of, say, The Scamperbeasts? I was delighted to see Sub Press’s announcement in my e-mail this morning, and I ordered one straight away. Did I miss the “when”? I just ordered the leather edition! It doesn’t say so, but I’m assuming it will be signed? I know the $40 version had that listed. I can’t wait to get it! Given that you’re clearly flying, I’d have to call that a churro-pega-corn. All my other Scalzi books are Kindle, but I pre-ordered the $40 because Signed! I’ve been unable to go to your two most recent Portland, Oregon visits, so this is the next best thing. Fine. Twist my arm. Might be the first limited edition anything that I’ve ever owned. Ordered! Having been to a few readings (include two that were a week apart), I’m definitely looking forwards to the collection. Question: Any opportunity for personalization? Or should I retract the question so we can preserve your sanity for future writings? @Mark: Subterranean limited editions come pre-signed, and are created by having the author sign a stack of sheets that are then bound into the final book (see https://whatever.scalzi.com/2014/07/12/24839/ for an example of how it looks). There’s no way to get them personalized, unless of course you take the book to a Scalzi signing afterwards. 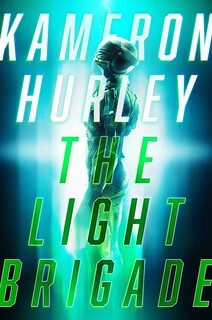 That being said, my copy has been preordered. Not to seem too picky, but 2,300 words is not terribly short. The denizens of the sudden fiction workshop I attended thought anything over 500 words was way too long. That said, I look forward to obtaining a copy. Ordered. And Spouse and I are already bickering over which of us gets dibs when it arrives. Ordered! Future Me is gonna love the surprise. Ordered, and that leaves only 1.442 to go according to my calculations.